The warm tropical sun shines high above in the clear blue sky. The smell of coconuts wafts through the air as we scan the water ahead for motion. A sliver of silver is seen and the excitement builds as we wade toward our quarry. 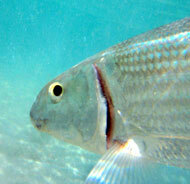 A large bonefish working the flats of a remote atoll is unaware of our presence. The angler stands up straight, takes aim and casts. An ideal arc is made draping the line in a gentle slope landing a fly right in front of our quarry. We wait five seconds for the fly to sink and catch our fish’s attention. The bonefish’s eye glances downward. The angler stands perfectly still and twitches the line. The bonefish can’t resist our hand tied “shrimp” and lunges at the fly. The rod is pointed toward the fish and a palm held against the reel to take up tension and set the hook. The bonefish explodes away from the angler, and the sleigh ride begins. The rod is held 90 degrees to the fish. The reel lets out a long screech and the line cuts the water in a long arc. The bonefish heads for the horizon, but is turned. He swims for the surface just a half meter away, arcs, and aims to wrap the line around a coral head. Again he is turned and now charging straight toward the rod. We clearly see into the green/blue water. Our bonefish is enraged and fights along the surface. The angler works the reel attempting to bring the fish in quick to release him early, increasing the hook and release survival rate. From the edge of our vision a green flash streaks through the water. A black point vibrates across the surface of the calm water. The motion is too fast to focus on, but we know the movement of a black tip shark. It will take a team effort to save our fish. “Stomp him, stomp him,” Ross calls. I run across to the shark’s path aiming to turn him away from our prey. The black tip makes a quick direction change, rounds and begins a slower approach from behind. More sharks appear attracted by the commotion, looking for an easy feed. It’s now or never. Ross reels in his fish, reaches a hand under the belly and raises the silver body clear of the water. A quick photo, a last charge of the shark and our hearts pumping, we’re ready to release. 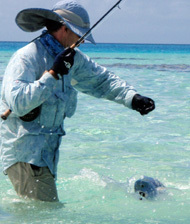 This is saltwater flyfishing and one of the most addictive sports on the planet. Once hooked on the thrill of a bonefish run fishermen have been known to devote their lives to seeking out remote locations nearly untouched by civilization in an attempt to cast a fly into virgin water. 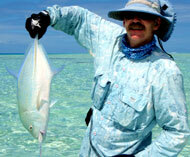 In this article were going to present a saltwater fishing primer of the South Pacific. We’ll discuss how and where to fish from a yacht, dingy and for those considering entering the sport of flyfishing we’ll provide an easy first time instruction on the equipment needed and of course where to flyfish. The information presented in this article is taken from a loop through the Pacific aboard Mariah, a Catana 582 luxury catamaran. Normally stationed in the Tongan as the flagship of the fully crewed Moorings charter fleet we drove this magnificent vessel 1800 miles upwind, to the Tuamotus to begin our hunt. 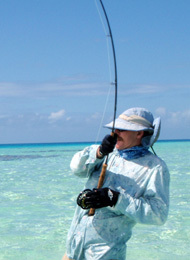 Flyfishing is considered the most sporting fishing technique yet developed. A hook and release activity that is a game of cat and mouse where the fisherman must know his quarry well enough to predict his chosen food source and place of feeding. Light line, small rods, and holes for fish to hide inside increase the sport. The fish is played to the fisherman where he is normally released slightly worse for the wear. 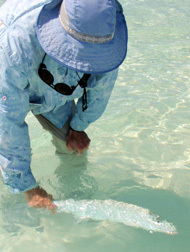 The first step to catching a bonefish is finding a “flat” where they thrive. Flats are the shallow areas inside a reef in water about knee to ankle deep and show up as white areas on Google Earth. Bonefish feed in the flats, on the “sand” or downwind side of the island. Generally the weather side of the island has flats of coral that show up as blue on Google Earth, while the lee side has flats of sand. This is because the complete atoll might be thought of as a large gold pan. The light material is pushed to the lee side, while the heavier material stays near the weather side. This means in the South Pacific look to the North West corner of an atoll for a white sand patch. In order for bonefish to survive they need a food source. When hunting for good bonefish grounds look at the sand and check for abundant food sources such as clams, shrimp, worms or evidence of life. Bonefish are particularly susceptible to gill nets. Generally any island that allows gill nets won’t have bonefish. 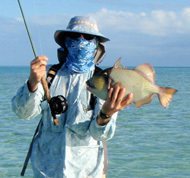 In such areas consider throwing a fly for the ever present trigger fish that also provide a great fight. Often an island will prohibit gillnets, but in reality the carnage continues. While walking the reef keep an eye out for bits of torn nets as evidence of previous net fishing. Bone fishing is a type of fly-fishing. Fly-fishing history goes back to early Europe where one of the first books to come from the new printing presses in the 1400’s provided instructions on bone fishing technique. Early technique included throwing a “cast” of flies where six or eight flies were tied to a single line. 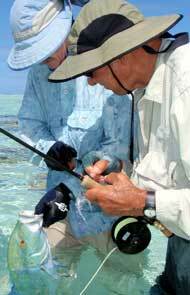 Using a cane rod, gut leader that had to be dried every night and silk line were all part of early fly-fishing. Today high tech fish line, graphite rods, composite reels and complete sun protection accompany the modern bone fisherman. Still the sport is basically unchanged in the last 500 years. A mystery noticed by fly-fishermen is the “professional courtesy” provided by sharks, to sharks hooked on a fish line. Sharks will often follow and attack a hooked fish, but they never seem to attack a hooked shark. A second fly-fishing mystery is why South Pacific fly-fishing has never taken off as tourist bonanza tour operators hoped it would. Probably the main reason is the inconsistency in successful fishing expeditions. Often a fishing spot will provide a steady series of hits one day only to have the fish ignore the same flies in the same wind and the same sun the next day. This inconsistency has left a poor taste in some fisherman’s mouth and is considered one of the prime reasons the sport is still relatively untapped in the vast Pacific. 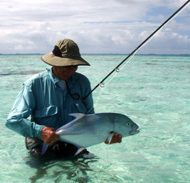 Luckily opportunities for fishing in the South Pacific abound. If the fish are not biting on flies try a troll for tuna just outside the pass, or drive the skiff just outside the reef casting a popper into the surf line trying to land a giant travallie or any of the many other reef fish. Most guides recommend taking casting lesson. The casting technique is relatively easy and can often be learned in a day with a little guidance, but it takes time to build a consistent accurate cast. Practice in your spare time trying to land a fly inside a hula-hoop from ten meters. Then aim for a hat, and finally a teacup. Wear eye protection. More than one fly fisherman has ended up having a hook removed from his face while learning the cast. Hire a local guide. A guide knows the best spots and can start a fisherman with a winning experience. Buy a good salt water reel with a good drag, wading boots (booties do not provide enough protection from shoe filling coral), and sun protection. Read “Bone fishing” by Randle Kaufmaun. The controversy about a light line fight for maximum fight or a heavy line to get the fish in and released still rages. Most guides want to see the fish survive the experience to be caught again so they recommend a heavier line to pull the fish in quickly thus reducing the stress on the fish to give it a better chance to avoid a shark attack when released. Choosing best fly to throw is a matter of much opinion and discussion. Pink and white is generally a good combination, while chartreuse has been a steady winner. Tip-A #4 Clousemen (white) have been reported an all around good performer in the South Pacific. In order to cast a fly to a fish we have to be able to see the fish. This is done by walking the flats scanning ahead first a short distance like five meters, then again about twenty meters. Look for “nervious” water, or areas of disturbed water on the surface. Scan for dark spots looking for relative motion indicating a moving fish. A light wind from behind is considered near perfect conditions. Too much chop prevents views into the water, and no wind allows the fish to see out of the water revealing the fisherman above. Sharks and salt water fly-fishing go together. Sharks work the shallow flats and are often seen during a fishing expedition. Luckily actual shark attacks are nearly unheard of. Most often a shark will follow a caught fish toward the fisherman only to retreat at the last moment. Sometimes a quick stomp into the water will drive the small shark away but most times they keep their distance. There are two specific warnings about sharks that should be kept in mind. New born sharks and Lemon sharks should be watched for. When walking in the sand a disturbed cloudy trail is left that may attacks baby sharks. These eight to ten inch sharks could possibly become confused and snap at your feet in the low visibility. If babies begin to follow the sand trail simply stop walking and let the current clear the water. The Lemon shark has been known to become aggressive. Lemon in color with two dorsal fins of the same height they should be left alone. Fish books describe the Lemon shark as “easily enraged”. Often the lemon sharks are seen drifting slowly through the flats and should be left alone. Actual Lemon shark attacks are very rare. Some fishermen will cast toward the sharks because of the strong fights they provide. Sharks don’t often strike at a fly even when it’s landed right in front of them. This is because sharks tend to have poor eyesight and flies don’t give off the electrical signal sharks use to find prey. If a shark fight is sought be careful of the line cutting sharp teeth. The trick is to set the hook the instant the shark bites thus hooking his lip away from the cutting teeth. 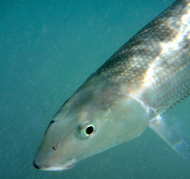 Milkfish are often mistaken for bonefish. To the novice they look similar and both give a great fight, but the milkfish is an algae eater and only occasionally will get hooked due to a mouth snag. To tell the difference between the two similar fish notice the position of the fish. Bonefish tend to swim along the bottom while the milkfish swim higher in the water column. Milkfish also have a tail that looks similar to a tuna. Christmas Island-When pacific fishermen think bonefish they think Christmas Island. The single flight a week from Hawaii is chocked full of bone fishermen waiting for their shot at the many blue lagoons. The charts of South Pacific are notoriously inaccurate with some reports of islands up to five miles off location. One trick is to compare the radar return to the chart to get an early idea of error. Approach islands during daylight and prepare to stand off at night. Once within the reef a close up from Google Earth has become the chart of choice. The color shows the depth and the accuracy is near perfect. Some chart kits now have satellite images overlaid on the chart that show most coral heads adding security to reef navigation. New satellite charts tend to show most dangers within a reef, but it’s still imperative to restrict all yacht movement between the hours of 10am and 2pm with a good sun overhead in order to see the green patches indicating boat crunching coral. Tip-Some satellite charts show large areas of white checkered markings covering areas of the lagoon. This is where a cloud obscured the original image and the area under should be considered uncharted. Fishing charters have generally been thought of as a man’s sport. A few specialty boats now offer the woman activities while the men spend the day in the skiff or on the flats. that allow the woman to have “real” vacation coupled to the “men’s” sport. Contact Captain Allison for more information. 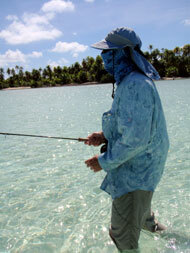 Flyfishing is most often done in remote locations. While some rugged individuals may camp on the beach most anglers will want to stay in a lodge or better, a boat where the daily fishing expedition can be made in comfort or even luxury. We fished from a Catana 582 catamaran with air conditioning, guided daily fishing expeditions, open bar, and nourishing home cooked meals waiting at the end of a successful fishing day. 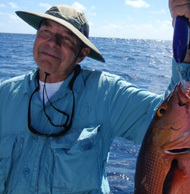 The kits listed below are by noted Polynesian flyfishing expert Ross Novak who has spent years guiding, instructing and searching the world for the best fishing deals. The kits listed below are recommended as entry level kits designed to give the experience of fishing, with good longevity of the gear without the high cost often associated with specialty gear. 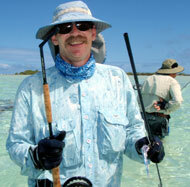 On a flyfishing vacation there are three basic types of fishing the angler has access to. We want to be set up for all three types of fishing so we can continue to fish when flyfishing conditions are less than perfect. Let’s take a look at the basic guide recommended starter kits for each type of fishing. 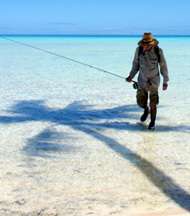 The video “The Search” is a real life drama of South Pacific fly-fishing and worth a watch. A River Runs through It”, directed by Robert Redford has been credited with a resurgence in fly-fishing and can be rented at your local video store.